Gabi & Edwin Rijnveld (Crystal Cable and Siltech) are members of the Krakow Sonic Society. Read High Fidelity magazine's (Poland) report on the visit this summer! 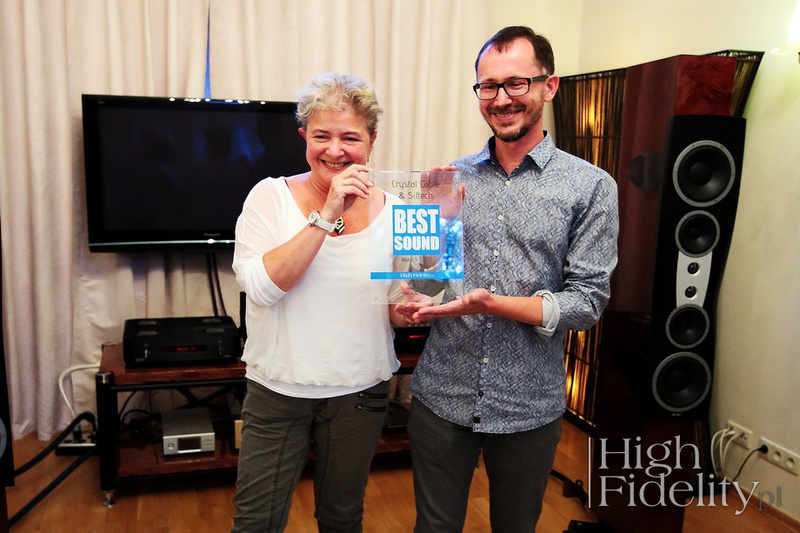 ne of the most pleasant things about the job that I do – let me remind you, I am a specialist journalist who deals with the aspects of high-quality audio – is contact with people who share my passion for music and its best possible reproduction. These two poles of audio, i.e. music (art) and the method of its mechanical reproduction (technology) are inseparable and, I think, either does not exist without the other. However, in real life, constructors come close either to the former or the latter side of the equation, thus leaving their fingerprints in the product – something that makes them unique. Perhaps this is why people who manage to keep almost ideal balance between these two elements are so interesting and trustworthy. 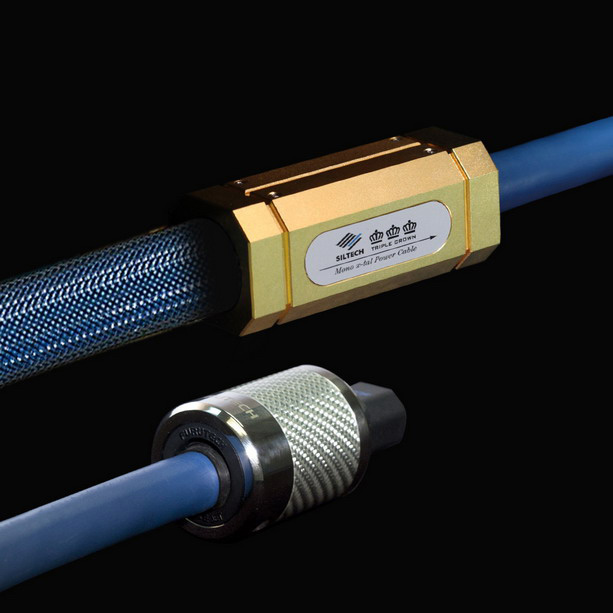 Our friends: Gabi van der Kley-Rijnveld and Edwin van der Kley, who have created the Crystal Cable and Siltech brands together as part of the International Audio Holding BV, are among them. Let me remind you that both of them are members of the Krakow Sonic Society and this is the second time they have attended our meeting. 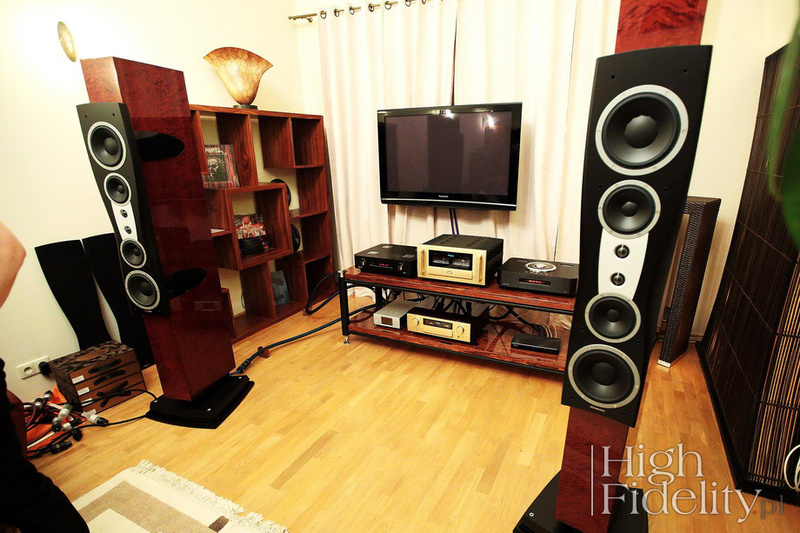 Previously, they came to Cracow with a novelty – the Siltech Triple Crown interconnects and speaker cables (read HERE). This time they visited us bringing power cables representative for both brands. Although both Crystal Cable and Siltech cables are designed by Edwin and manufactured at the same factory, the Crystal Cable brand is traditionally associated with Gabi, while Siltech – with Edwin. They highlight the division themselves, as each presents “their own” brand during exhibitions. What is more, delicate jewelry-like Crystal cables “fit” a women’s hand, while robust Siltech cables match a masculine style. Both brands have their target customers, as well as look and sound different. They share the same designer’s DNA, a similar outlook on the role of cables and the same factory. They differ when it comes to the type of conductors, their structure and sound. The presentations of new cables representative for both brands: The Ultimate Dream Power (Crystal Cable) and the Triple Crown Power (Siltech) have been the highlight of this year’s audio exhibitions, from CES 2017 in Las Vegas to High End 2017 in Munich. Let me add that a whole new series of The Ultimate Dream cables was presented, while Triple Crown interconnects and speaker cables had been known for about three years. Information on those presentations spread like waves on the surface of water and caused a lot of confusion. I have to admit that it was no exaggeration, but a real SOMETHING, as the presentation of Gabi’s system in Munich brought her the BEST SOUND award of our “High Fidelity” magazine – we gave it to Gabi at the beginning of the meeting. The Ultimate Dream Power is now the flagship Crystal Cable power cable. Although it has a small cross-section, because of which the cable is very flexible, it consists of a set of seven solid-core wires, each in a separate double screen made of gold-plated monocrystal silver and monocrystal silver-plated copper. Six of them are made of silver using monocrystal technology, while the central silver-gold core works as a low-loss drain. A double layer of Kapton and a material called PEEK (PolyEtherEtherKetone) was used for insulation. At their ends, the cables have modified pins made by the Japanese Oyaide company, from its top F1 series. Let me add that the cables are very flexible and come in an elegant box that resembles a small trendy suitcase. 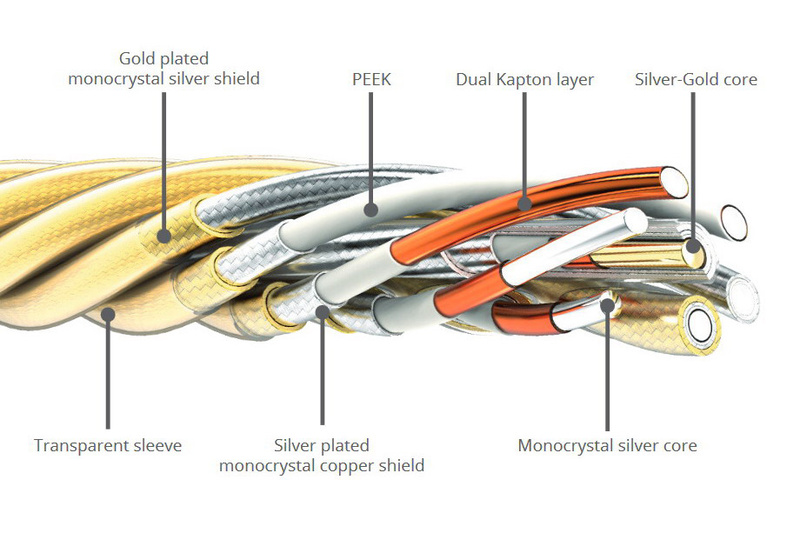 The new Siltech power cable makes use of new monocrystal S8 silver in air insulation (pipes with air). The topology is called Air Cradle Construction. 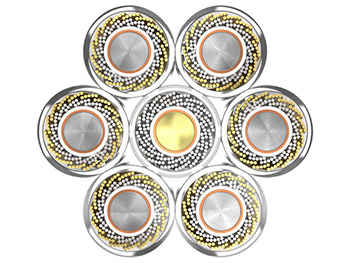 It combines conductors having a very big total diameter and Teflon-based insulation of ultra-low density. Such a combination results in very low inductance, resistance and capacity. While research was being carried out on the cables, the company made use of previously conducted experiments examining the behavior of conductors in a magnetic field, also using COMSOL (Multiphysics software) and measurements taken with the help of FW Bell (3D Gauss) and Audio Precision (THD). Although a power cable seems to be a not-too-significant element of an audio system, as “in the wall” and then in “the open air” we have kilometers of ordinary cables, the reality is more complicated. The thing is that magnetic fields generated by the flow of current in a cable are the cause of distortions in a few specific frequency ranges, then induced in all system devices as well as interconnects and speaker cables located nearby. Distorted current may be very high and lead to the saturation of the power cable, which additionally distorts supply voltage. The greatest distortions come from the higher harmonics of the 100/120Hz-450/500Hz frequency. That is why Edwin puts special emphasis on the best possible power supply of the power amplifier or integrated amplifier, as power consumption is the highest there. The most demanding devices are A-class amps with very high current peaks. Such an attitude is exactly the opposite of what we have agreed upon during meetings of the Krakow Sonic Society. We have come to the conclusion that the element which is most susceptible to the change of the power cable is the signal source – e.g. a CD player. Both sides may be right. The audio domain is based on comparisons and that is what we dealt with during our meeting. Power is supplied to Tomek’s system using inexpensive and pleasant Vovox power cables produced by a Swiss company, and we started our listening session with them. As we only had three Crystal Cable cables and there were four devices in the system, we used the Siltech Triple Crown Power cable in the power amp during the whole session. However, we changed three other cables – one used with the CD transport (Ayon Audio CD-T), one with the D/A converter (Ayon Audio STRATOS) and one with the Accuphase C-3850 preamplifier. First, we replaced the Vovox cables with a set of the Acrolink Mexcel 7N-PC9500 and then with a set of the Siltech Triple Crown Power cables. 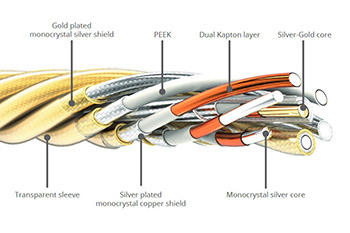 After a break we compared the Siltech cables with the Crystal Cable The Ultimate Dream Power. After the first and the second round I asked the participants for comments, after which we started a discussion. As usual, we did not totally agree with one another, except for one thing: the change of power cables resulted in very big changes in sound. The next part of the article attempts to inform you whether these changes were positive or negative. We listened to recordings brought by the participants. When it comes to my listening impressions associated with the subsequent cable sets, the first one, based on Vovox cables (i.e. the starting point), seemed quite aggressive to me and offered little differentiation, which I could hear especially clearly when we listened to the Emerson, Lake and Palmer trio’s Taurus – an album that I know quite well. The sound attacked us with chaos, creating dense magma. So, using Acrolink cables instead was a great increase in quality – there was more selectivity and space in all the tracks, although I could hear it most clearly in the case of the abovementioned ELP album. However, when Siltech cables were used, it appeared that what I had considered to be analytical but full sound, had actually created a shapeless mass of sounds, as real selectivity appeared only with those cables. At the same time, strength was not lost, especially in electronic music where tone contrasts became significantly more audible, while the softness and silkiness of vocals increased, particularly in the case of Nat ‘King’ Cole, whose timbre gained even more juiciness and depth. However, on the other hand, I was struck by the colorlessness of the orchestra, which constituted a background for the vocalist, and its clear separation from the vocalist who suddenly “came closer” to the listener, leaving instrumentalists far away at the back. However, in Bob Dylan’s deeper vocal that I have not mentioned yet, the cables twice as powerfully revealed a certain hissing effect with some consonants, which I had not perceived as unpleasant earlier, with Acrolink cables, and which now irritated me a little. Tarkus sounded even more interesting here, there were even more transparent details coexisting in a powerful wall of sounds that did not, however, merge into a “jelly”. Generally speaking, the cables revealed both the advantages and disadvantages of a recording, which may sometimes mean disappointment. However, it appeared that the most surprising change of cables was yet to come: when I listened to Infected Mushroom, or especially Ed Sheeran, Crystal Cable made me feel that this was different music – it seemed the tone changed, sound became darker and reverberation, which must have been present in the recording, could be heard now, revealed by the cable. As we listened to those pieces at the beginning of the session with Crystal Cable and the change brought about such a striking effect, it stayed in my mind during the rest of the “program”, influencing my reception of pieces of Dylan’s, Nat ‘King’ Cole’s and Emerson’s music. It was hard for me to focus on capturing the differences between the present and the previous cable, as music simply gave me so much pleasure that I did not think about why I listened to it. In the end, this is what it is all about, isn’t it? To recap, I would like to stress that, as other participants in the meeting also observed, I lacked a sample of classical music. Although I listen to jazz, I know Dylan’s works and I also often listen to old progressive rock (with electronic elements like on the ELP album), contemporary pop or electronic music (e.g. Infected Mushroom) was a new experience for me. However, despite everything, it would have been even more conclusive to compare this kind of music with what I know best, i.e. the set of instruments of a symphonic orchestra or an orchestra playing early music. That was my only reservation about the otherwise really inspiring experience. As a guest and an absolute debutant at the meetings of the Krakow Sonic Society, I do not feel especially entitled to make judgments in the field of sound, particularly because it is harder for me to evaluate due to a lack of classical music, mostly vocal, which I deal with every day. Despite these limitations, I was could listen to artists representing different epochs, styles and genres, which allowed me to formulate an initial opinion on the topic we were all interested in, i.e. changes introduced by the new Siltech and Crystal Cable cables into Mr. Tomek’s system – changes that were discussed with reference to the highly valued Acrolink 7N-PC9500 cables. During the first part of the listening session we used our host’s cables and I must admit that it came across as the worst, compared to the subsequent sets, which can be illustrated using two examples: the first minutes of the Emerson, Lake and Palmer’s Tarkus suite and Nat King Cole’s But Beautiful song from The Very Thought of You album. In the former case, I got the impression of complete sound chaos, while in the latter the velvety vocal of the American singer seemed to be located too much in the foreground and aggressive, while emphasized sibilants deprived me of the pleasure of listening to this piece. The problem with Nat ‘King’ Cole disappeared when Acrolink cables were connected to the system. They tend to slightly withdraw human vocal and smoothen contours without losing details and selectivity, thanks to which the Gordon Jenkins orchestra accompanying the singer did not sound as harsh as before. Bob Dylan came across equally well in a very beautiful ballad You’re a Big Girl Now, but something was still missing when we listened to ELP, while Infected Mushroom’s trance music seemed less convincing. Tarkus gained life and took on the right proportions only with the Siltech cables. The sound stage was finally ordered and I did not get the impression of chaos. The dynamics was much higher, Ed Sheeran and Infected Mushroom sounded better than before, while Nat ‘King’ Cole and Bob Dylan came across a little different, although it is hard to say if better. In their case, it was not about the difference in sound quality, but something less perceptible that I am unable to properly define after such a short listening session. To sum up this comparison stage, I would say that Siltech won, but scored just a few more points. However, we did not listen to small jazz bands or symphonic music (an additional round would have been useful). After a break we moved on to the last stage, i.e. a direct comparison of the two new power cables, and, in this respect, the participants’ opinions were the most divided. We listened to two additional jazz albums – Rosemary Clooney and The Oscar Peterson Trio, replacing Emerson and Dylan with them. The Ultimate Dream cable surprised me positively, as I had not listened to products manufactured by Gabi Rijnveld’s company before. What is more, it worked really well both in the case of Ed Sheeran’s and Infected Mushroom’s dynamic music, as well as, which is much more important to me, in the case of a small jazz band. The sounds of Ray Brown’s double bass and Ed Thigpen’s drums did not silence or suppress the pianist, which I felt was the case when I listened to this standard with Siltech. Vocal music (i.e. Nat ‘King’ Cole and Rosemary Clooney) appeared to be more problematic. I could hear unwanted elements in the singer’s vocals and in the sound of the accompanying bands, but I got that impression only some time after the meeting ended and I would need to return to that set in order to listen to it again. I am a 100% engineer, so, for me, the influence of power cables on sound is an experience close to magic or a cosmos with a different space-time curve… However, we could hear what was happening already when Acrolink cables were used. I have known these cables for 10 years and I know what they are capable of. Using an Acrolink power cable can usually be compared to tearing a curtain off. So, I was really interested in the Siltech Triple Crown. And that was IT, to tell you the truth. And the truth is that we are overloaded with false information. This is what CD does – it serves rubbish that disturbs us – hence such admiration for vinyl or tape. The Siltech cable was dark, without artificial trinkets. And then the orchestra from Nat ‘King’ Cole’s album started to swing.